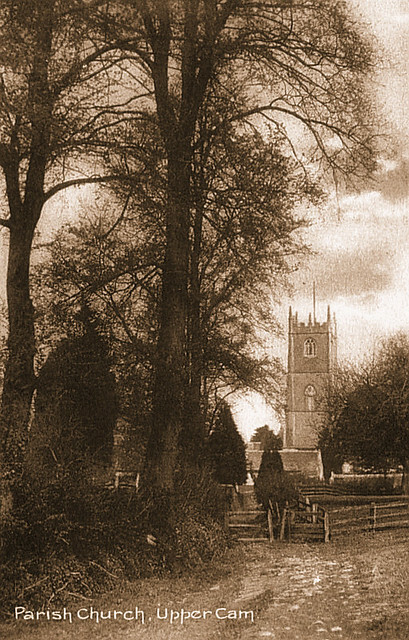 An early photograph of Upper Cam, taken around the time the Wotton Branch was formed. Iron lowside on a grillage of timber beams by Thomas Blackbourn in 1901. Hollow box-section iron headstocks with fixed steel gudgeons, ball bearings, traditional-type wheels, stays and sliders by John Taylor & Co. in 1994. The Original treble added by Thomas Blackbourn in 1901, weight 6cwt 0qtr 6lb was retained as a service bell.